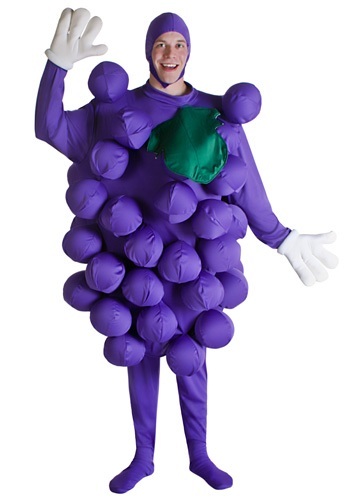 This costume is perfect for you if your favorite food snack is grapes! This 92% polyester and 8% spandex long sleeve purple grape costume fits easily over the head. The costume is covered in purple sacks with slits on them so the included balloons can be inserted and then blown up. This makes them look like real jumbo sized grapes. There is also a huge green leaf on the front of the costume. A matching purple cap that velcros under the chin is included. Pair this up with our matching purple tights for the complete look, straight from the fruit bowl!